Our hand crafted soaps are made in small batches from organic oils, lye and local herbs. We use the cold processed method that retains natural glycerin. These moisturizing soaps clean and nourish the skin with a long-lasting lather that leaves your skin feeling soft, and radiantly healthy. Our soaps hold up well if kept dry and are great for people with sensitive skin! Enjoy our heart shaped soaps or the classic bars. Our soaps are handmade from organic oils, honey and local herbs using the cold processed method that retains natural glycerin. These moisturizing soaps clean and nourish the skin with a long-lasting lather that leaves your skin feeling soft, and radiantly healthy. The added oats have an exfoliating effect, while being soothing to the skin. The touch of honey lends a moisturizing and antimicrobial quality to this soap. The Oats and Honey Soap is one of our favorites! 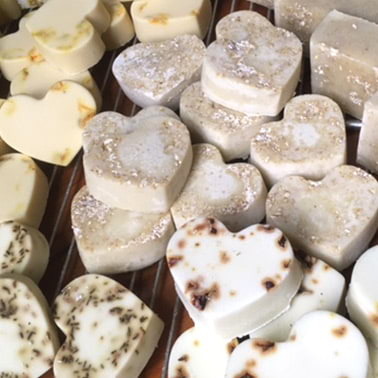 Our soaps are handmade from organic oils and local herbs using the cold processed method that retains natural glycerin. These moisturizing soaps clean and nourish the skin with a long-lasting lather that leaves your skin feeling soft, and radiantly healthy. The added lavender flowers and rosemary herb offer a subtle fragrance that is gently soothing. Our soaps are handmade from organic oils and local herbs using the cold processed method that retains natural glycerin. These moisturizing soaps clean and nourish the skin with a long-lasting lather that leaves your skin feeling soft, and radiantly healthy. The added calendula infused olive oil and calendula flowers further enhance the soothing qualities of this natural soap. Our soaps are handmade from organic oils and local herbs using the cold processed method that retains natural glycerin. These moisturizing soaps clean and nourish the skin with a long-lasting lather that leaves your skin feeling soft, and radiantly healthy. The wild rose petals and rose essential oil lend a light rose scent to this lovely soap. Our soaps are handmade from organic oils and local herbs using the cold processed method that retains natural glycerin. These moisturizing soaps clean and nourish the skin with a long-lasting lather that leaves your skin feeling soft, and radiantly healthy. Local Rosemary and peppermint leaves are added to give a refreshing clean scent and a slight exfoliating effect. Our soaps are handmade from organic oils, honey and local herbs using the cold processed method that retains natural glycerin. These moisturizing soaps clean and nourish the skin with a long-lasting lather that leaves your skin feeling soft, and radiantly healthy. The touch of honey lends a moisturizing and antimicrobial quality to this soap and the fragrant spices are warming and rejuvenating.